Sizzling booty shorts & tops for your dance team or cheer squad. Metallic Booty Shorts by Danshuz in youth and adult in 4 hot colors made of nylon/spandex. Roll-Down Waist Shorts by Pizzazz in youth and adult in zebra, hot pink zebra, red zebra, turquoise zebra, and lime zebra, minimum order 8 pairs. 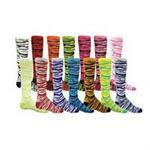 Popular Safari Socks in tons of colors, available in youth (#7913), ladies (#7914) & men's (#7915) sizes. Minimum order 12 pairs.